This Dutch steel cruiser left the Jachtwerf Bijlsma yard in 1991. All the hallmarks of a quality Dutch construction and the advantage of transom stern allowing much improved aft cabin space. Aft cabin, central berth, (120/140 wide and 190 long) headroom is 1.88. Huge shower and basin on port side and separate electrical macerator heads and basin on starboard side. Bright and spacious saloon with internal helm on port side and drinks cabinet and tv corner opposite. Headroom is 2m. this dutch cruiser has cruised on the Canals of Centre, Latéral à La Loire, Loing, Briare Canal, North of Paris and is now lying in a port next to the Saone. Dutch steel cruiser for sale in France. 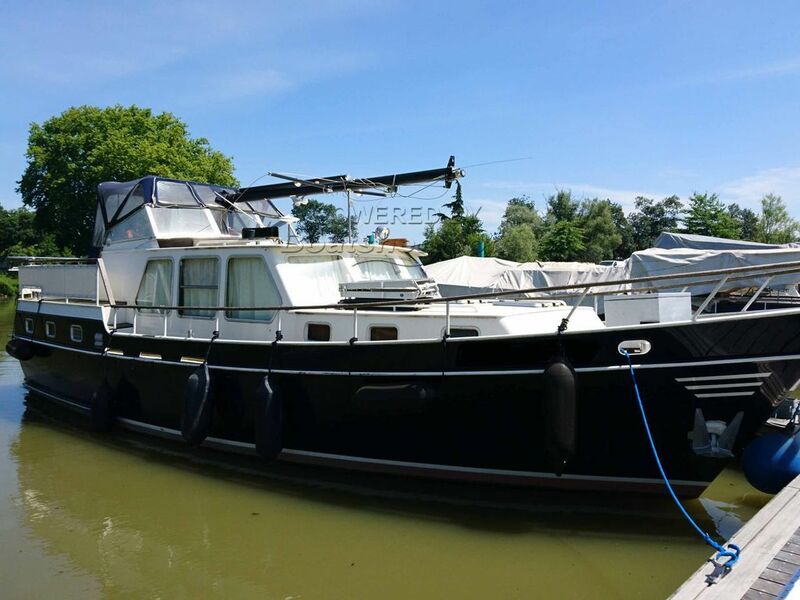 Boatshed Bourgogne is pleased to offer this Dutch Kotter live aboard cruiser for sale in south of Burgundy. A very nice quality steel cruiser Bijlsma Kotter built in 1991 by the famous JACHTWERF yard in the Netherland. Just look at our videos and photos, and you will find it is a good solid built motor yacht which could be an ideal home for a family or a couple who wish you to cruise the French waterways and rivers & coasts of Europe. Just 1m draught allows easy cruising on canals. For more information or organise a visit, please contact Graham your local broker at Boatshed Bourgogne. This Dutch Kotter 12.20 Live Aboard River & Coastal Cruiser has been personally photographed and viewed by Graham WHARMBY of Boatshed Bourgogne. Click here for contact details.